Cynthia L. Cook/Cox, 54, of rural Albion, Illinois, died Saturday, April 6, 2019, at Wabash General Hospital in Mt. Carmel, Illinois. She was born October 16, 1964, in Mt. Carmel, Illinois, the daughter of Gerald and Lorene (Patridge) Cook. She was married to John Cox, and he survives. 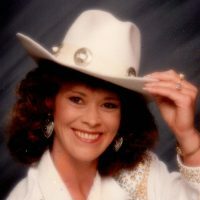 Cindy was a bartender and an avid horse enthusiast. She enjoyed trail riding, especially in the Shawnee National Forest. She loved her horses and loved being with her friends and family around a bonfire while enjoying a “cold one”. Survivors include her husband, John Cox of Albion; sons John (Amanda) Cox of McLeansboro, Illinois, David Cox of Grayville, Illinois; daughter Cierra Cox of Albion; sister Pam Cox of Mt. Vernon, Indiana; grandchildren Skyler, Nevaeh, John, Abbee, and Shylah. Visitation and funeral are Tuesday, April 9, 2019, at Cook Funeral Chapel in Grayville. Visitation is at 5 pm and continues until funeral time at 7 pm. Memorials may be made to Cancer Treatment Centers of America and will be accepted at Cook Funeral Chapel in Grayville. I am so sorry for your loss John & family. Cindy has been in my continued prayers. Sending prayers for the Cox family & asking God to give you all peace & comfort.